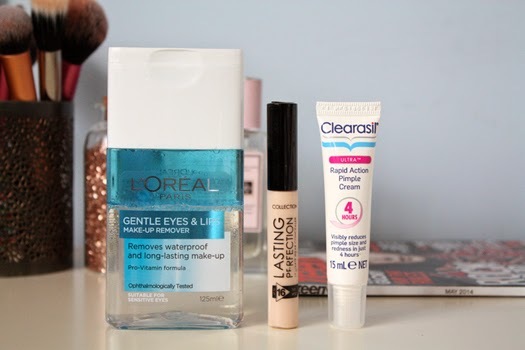 Collection Lasting Perfection Concealer in Light, available from Countdown-This post unintentionally turned into a bit of a Countdown haul, my apologies! This concealer is very popular among the British beauty blogger set and it is easy to see why. The light shade is a tad too light for me so I can't use this on top of my foundation but it is great for under-eye concealing. It is thick yet still easy to blend and it lasts well once you powder it down. My local supermarket didn't have testers for these concealers so if you're unsure look up swatches/vlogs online first to find a colour match. Clearasil Rapid Action Pimple Cream-Now this probably seems like a bit of a bizarre inclusion. Back in the days, pre-facialist recommended products and a doctor's prescribed gel which only seemed to ruin my skin and strip it of moisture, Clearasil spot treatments were what I used. They're probably not the best ingredient-wise but hey, it does the job. I wouldn't necessarily say this is a rapid solution but it definitely helps to shrink blemishes, you just have to be a bit patient with it. When used in conjunction with this you have one powerful duo. *Have you tried any of these products? What are your latest beauty discoveries? Oh no, that's a shame. It's a bit annoying there's no testers around but oh well, at least it's still useable :). Ooh, I'm so happy that you mentioned an item from the Collection range! I've spotted their products in Countdown and they look oh-so pretty, but without seeing any reviews of how they actually perform, I've been hesitant to take the plunge. NOT ANYMORE!